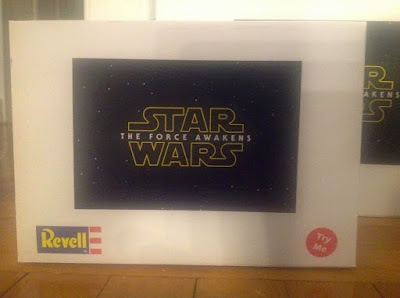 You might remember earlier this year when Yehuda wrote his excellent report from Toy Fair and singled out Revell models as a company which best understood the Star Wars brand and its fandom. The company also set up a booth at Star Wars Celebration Anaheim, and while it wasn't the largest display space a Star Wars licensee had at the show, it was probably the one I most enjoyed. Their booth was populated with a selection of display models from their line of vehicles from the classic and prequel trilogies, and several shelves of their mysterious and now infamous white The Force Awakens boxes. The still new and unfamiliar logo wasn't found on a great deal of products at Celebration, so seeing it on packaging was a real treat, even if the boxes themselves were empty. Revell's plans for the film seem to be quite ambitious however, with a variety of price points and target age groups focused on. Sadly, at the time, their representatives were unable to offer additional information on which sets they might be releasing for Episode VII or when LFL/Disney will allow them to do so, but I got the sense from speaking with them that they were just as eager for the reveal as the fanbase is. And there seemed to be no shortage of people who were also interested in the models the company had on display, judging from the amount of product they sold at the convention and the number of people who crowded their stand all weekend. Well, one of their representatives just sent me the above teaser image of their upcoming product launch, and I have to say, I'm genuinely excited to see the unveiling. There is going to be a LOT of product coming out for Episode VII, most of it unveiled on September 4th, but Revell's announcement is probably the one I'm looking forward to the most. To be perfectly honest, I haven't bought a model kit since I was a kid. But standing there and speaking to their representatives, I remembered all the fun I used to have putting them together. They are super nice people and their enthusiasm for their brand and their products was infectious. And now, months later, this simple teaser image has made me even more excited to see what they've cooked up. Kenner Kids Vol. III: "Come on... PUNCH-ME!"